Blu Ray video, formatted with MTS or M2TS, usually causes a significant obstacle for mobile device playback, like play Blu Ray on iPhone, iPad or Android devices. In such case, a solid video converter is seemingly of essence. Here in this article, a top Mac-based Blu Ray video converter will be introduced to you, letting you convert Blu Ray to MKV, MP4, MOV, AVI, MP3, etc. as you wish. 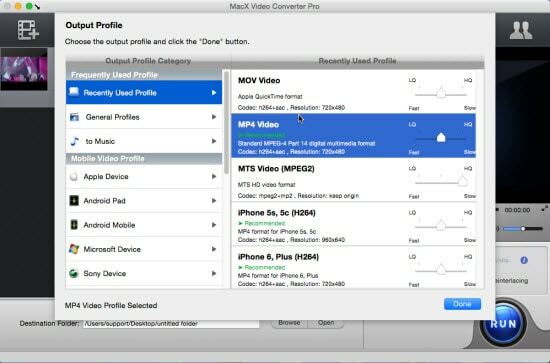 MacX Video Converter Pro makes your Blu Ray 1080P video conversion task as simple as possible. Just a click away, you can trouble-free convert Blu Ray video to MKV, MP4, MOV, AVI, FLV, MP3, etc. with 1080P high definition. Better still, this cutting-edge Mac Blu Ray converter can also empower you to compress Blu Ray to iPhone 6s/Plus, iPad Pro/mini 4 Retina, Samsung Sony HTC, etc. with suitable file size to save your mobile device space as far as possible. Speaking of Blu Ray video conversion speed and quality, you will certainly give a thumb up to its incomparable fast speed and video high quality, up to 16X faster than before, 5X faster than any other Blu Ray converters and 98% quality reserved, thanks to its advanced Intel Quick Sync Video hardware acceleration tech, multi-core CPU use and High Quality Engine supports. How to Apply this Blu Ray Video Converter for Mac to Convert & Compress Blu Ray Videos? Step 1: Free download this world class Blu Ray video converter on macOS and run it on your computer. Import the Blu Ray 1080p video file you plan to convert by clicking "Add File" button. Step 2: Choose an output format. Here you're allowed to choose converting Blu Ray to MKV, MP4, MOV, AVI or converting Blu Ray to iPhone iPad Android. All depends on you. Step 3: Followed by destination folder selection. Click "Browse" button to opt for the place to save your converted Blu Ray videos. Step 4: Click "RUN" and this 1080P Blu ray converter for Mac will order its transcoding and compression engine to begin the Blu Ray 1080P video conversion and compression task. Only several mins later, you can eventually get your Blu Ray video in the video format you need. 1. In case you wanna convert Blu Ray 1080P video for playback with Blu Ray player, then you can convert Blu ray M2TS/MTS to any famous digital format like MKV, MP4, MOV, FLV, AVI, WMV, etc. 2. In another case, the purpose of Blu ray video conversion is to playback Blu Ray 1080P on mobile device, then you're suggested to directly convert Blu Ray video to iPhone iPad Android Samsung HTC Sony, etc. with 420+ preset profiles provided for you. 3. For those who mean to compress Blu Ray video for fast uploading to YouTube, FB, etc. website, the great choice is to convert and compress Blu ray 1080P to FLV, AVI, WMV with much smaller file size so as to upload to website with shortest time. 4. Free downloading 1080P Blu ray 3D video from websites is also easy as taking candy from a baby. With this Mac Blu ray converter & downloader, you are also the master to free download Blu ray movies in HD/3D from YouTube, Facebook, Vimeo, Dailymotion, etc. 1000+ video sharing sites. 5. This all-round Blu ray converter for Mac also works well as a Blu ray editor to allow you to trim/crop Blu Ray video, add subtitles to Blu ray video, add watermark to Blu ray video, adjust Blu ray video parameter settings (Bit rate/resolution/frame rate, etc.) and more.